Dried Thai bird’s eye chili peppers from my garden. They are incredibly hot, measuring 100,000~250,000 SHU. After picking, wash them, then dry on a towel. I place them in my outdoor smoker and dry at 100°F for about 30 minutes. All chiles are believed to have originated in the New World; specifically in the Amazon jungle where as tiny, wild berries they were propagated throughout South America into Mesoamerica by migratory birds (unaffected by the heat of the capsaicin) and further spread through cultural exchanges by pre-Columbian civilizations, predating the Olmecs. Chiles were one of the earliest domesticated plants, with archaeological evidence dating back over 8,000 years. The Mayans cultivated at least 30 different varieties of chiles for dietary and medicinal uses and the Aztecs developed sophisticated cuisine utilizing chiles that evolved into today’s Mexican mole sauces, pipian sauces and tamales. Evidence dating back a thousand years has wild chiles, similar to the chiltepin growing in the Sonoran desert, gathered and used by the Anasazi and Pueblo Indians of the Southwest. Columbus, upon first discovering the chile in the 1400’s, thought it was black pepper, a very valuable commodity on the European market. Hence the name chile pepper. However chiles proved easier to grow than pepper and were a welcome addition to diets throughout the world. Spanish and Portuguese explorers introduced them along maritime trade routes into North and West Africa, Madagascar and India. The chile plant had spread from the New World to become a staple in the old within 100 years, reaching in the mid 1500’s Western China, Southeast Asia, Tibet and the East Indies. Even landlocked Hungary’s cuisine was forever changed by the arrival of the Ottoman Turks and paprika, a powdered form of the sweet red chile. The substance that makes a chile pepper so hot is Capsaicin [kap-SAY-ih-sihn]. Most of the capsaicin (up to 80 percent) is found in the seeds and membranes of a chile. The heat in dried chile peppers is measured in Scoville Heat Units. Pure capsaicin rates over 15,000,000 Scoville Units. For more meaningful purposes, chili peppers have been market rated on a heat scale of 1 to 10. Capsaicin, the oily compound that causes the heat sensation in chilis is easily spread by water, but not broken down. If you bite into more chile heat than you can tolerate, try dairy products instead; cheese, milk, yogurt, sour cream or chew on some corn, rice, bread, beans or potatoes, as the fat or starch content will absorb and dilute the capsaicin. 8 to 10,000 years ago, pre-Colombian cultures used the chile (one of the earliest cultivated crops) as a dietary supplement and for its medicinal properties. The chile may also have been used as a combat aid, possibly the first form of tear gas. Providing the wind was blowing over enemy lines, fires burning chile pods would set adrift searing, choking, impenetrable smoke. Do not try this at home! Always wash your hands after handling hot chiles. When soaking chiles, add some salt or vinegar to the water to reduce heat levels. In this method it is not advisable to reserve the liquid for puree. Run cool water over chiles to remove any dust. Dry them well before roasting or toasting. Place the chiles under a broiler or gas flame, turning frequently for 3 or 4 minutes to avoid scorching. The released oils should partially rehydrate and plump the chiles up while improving flavor and making the removal of skin (if desired) easier. Cool and place chiles in a heat proof bowl, pour near boiling water over them. Cover, making sure that they aren’t floating, soak for approximately 20 to 30 minutes until softened. Reserve the soaking liquid as it can be used as a thinning agent or pureed with the pods. When removing stems, scars, seeds and membranes (the veins or membranes contain the highest concentration of capsaicin) rubber gloves are recommended as the pungent oils can stain hands and cause some very unpleasant burning sensations if you inadvertently touch any part of your body or face, especially the eyes! Handle with care! Always wash your hands thoroughly. With smaller dried chiles like De Arbol and Pulla, just the stem ends need to be removed, using the entire pod; membranes and seeds. 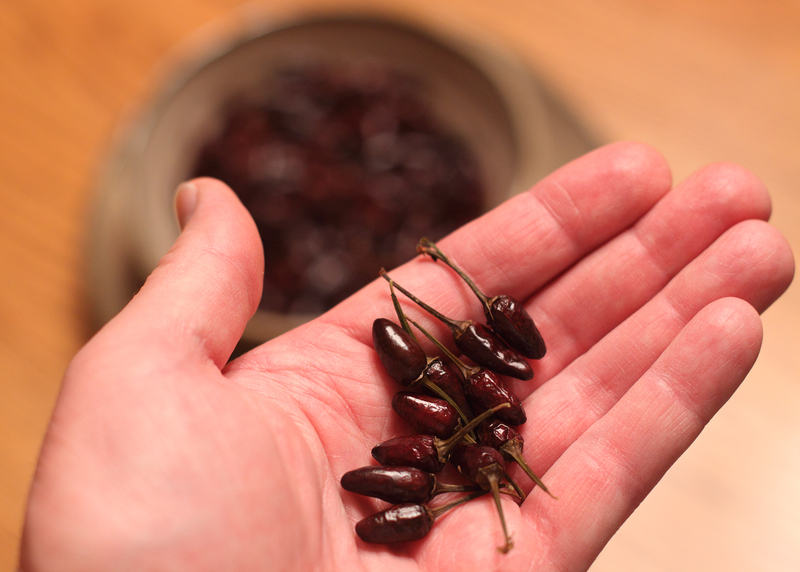 Chiles can be pureed into a chunky paste or pulp with reserved soaking liquid. The pulp is then ready for your required purpose, whether fried in oil with other ingredients to create your hot chile base or frozen for future use. 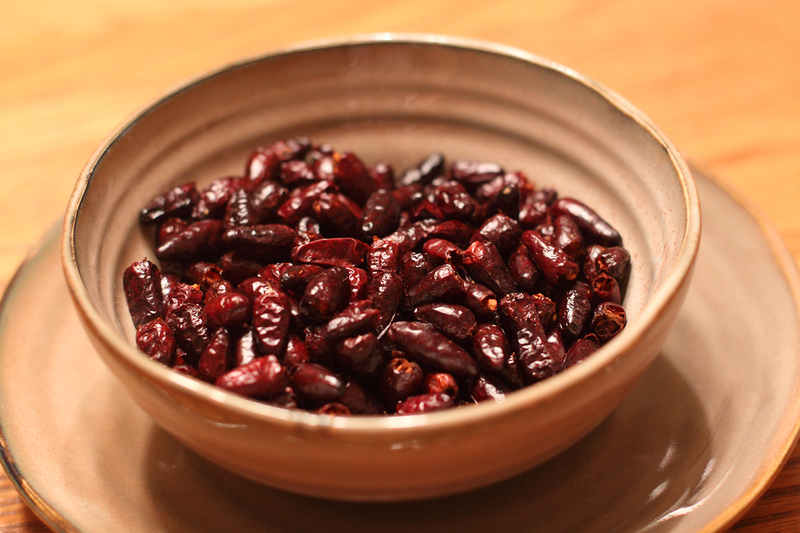 Dried chiles have a long shelf life. They will retain their rich and pungent flavor for more than one year if stored properly in airtight containers and kept refrigerated. If kept in your pantry, keep them sealed in a jar and try to use them within a year. Chilies are loaded with vitamin A, a potent antioxidant and boost to the immune system. As the pods mature and darken, high quantities of vitamin C are gradually replaced with beta carotene and the capsaicin levels are at their highest. Due to these capsaicin levels, some believe that eating chiles may have an extra thermic affect, temporarily speeding up the metabolic rate, hence burning off calories at a faster rate. Whatever — you certainly do sweat and actually cool down in hot climates as sweat evaporates. They are also very therapeutic in clearing nasal passages due to colds, asthma or allergies. The nature of fiery capsaicin has been medicinally beneficial down through the ages and put to use for some chronic health woes. These same heat inducing properties have a cumulative effect and over time are believed to alleviate pain when used in transdermal treatments for arthritis, nerve disorders (neuralgia), shingles and severe burns — even cluster headaches. The mucus thinning properties promote coughing and can act as an expectorant for asthmatic conditions. Other claims are boosts to the immune system due to the antioxidants, lowering cholesterol, and blood thinning properties beneficial for the heart and blood vessels. Booyah! Because of the cumulative effect of capsaicin, people actually build up a tolerance and increase the amounts of chile in their diets. With all the healthy attributes mentioned above, this comes as no surprise. Low Sodium. Chiles are also a wonderful and healthy addition for low sodium diets. The delicious pungency of the chile pod in any dish can confuse the taste buds and reduce the desire for salt. 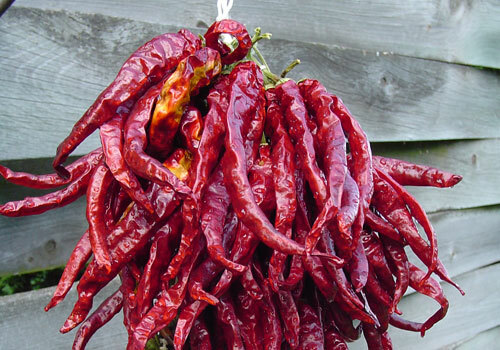 Cayenne peppers add a decorative touch when hung out to dry on a traditional ristra during harvest season. When fully dry, remove the stems, then grind or crush them. Store in an airtight spice jar in your cupboard for up to a year.